With upgradable software, humidity sensor, filter service and maintenance reminder alerts, this home automation thermostat and control uses Z-Wave technology that allows you to manage your home comfort from wherever. 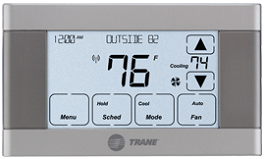 The Trane XL624 control is an innovative programmable, touch-screen thermostat control that is compatible with Trane as well as any other brand of standard central heating and air conditioning systems. It is compatible with Nexia™ Home Intelligence and includes Remote Climate Access*.